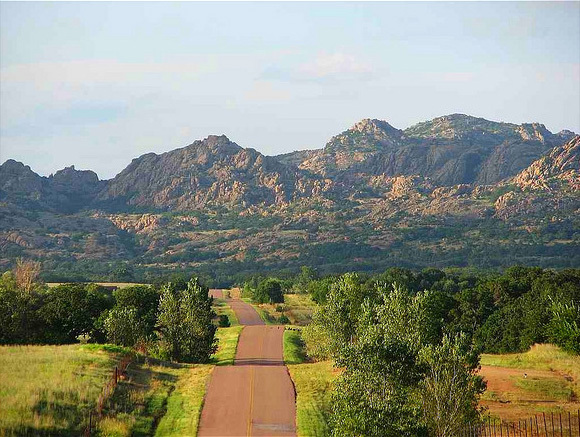 South Mountain, Wichita Mountains, Oklahoma; photo by Jonathan C. Wheeler on Flickr (use permitted with attribution). Other nominees included "After Midnight" by Oklahoman J.J. Cale; "Never Been to Spain" by Hoyt Axon (recorded by Three Dog Night); and "Heartbreak Hotel" (co-written by former Oklahoma school teacher Mae Boren Axton and recorded by Elvis Presley). The Oklahoma Legislature adopted a resolution in 2008 which outlined the voting process. The Oklahoma Historical Society conducted a competition to select the official state rock song and Oklahomans nominated 454 songs. From these a list of 10 songs were selected by a panel of experts. More than 21,000 voted online, with nearly 51 percent selecting "Do You Realize??" by The Flaming Lips from the finalists. (source: Associated Press Writer Ron Jenkins). Add Media for Do You Realize? ?